I hope you have been loving the special Halloween edition of Wild About Books Wednesday! Books are a springboard for language and I love incorporating fun stories in speech-language therapy! There are so many great books to use in October! 1. Rhyming: It’s written in rhyme which is great for building phonological awareness! 2. Inferencing: The pictures in this book are absolutely incredible! They’re colorful and fun! I love that the author doesn’t immediately say what the mummy is going to swallow, so you can look at the pictures to make an inference! 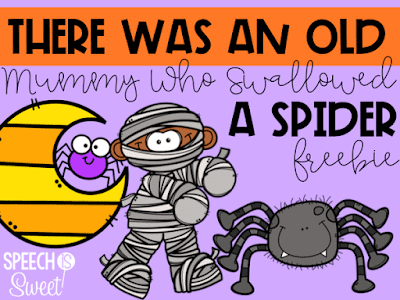 There are two whole pages full of pictures accompanied by “There was an old mummy…” and then students can look at the picture to figure out what he’s going to swallow next! For instance, in one scene there’s a skeleton that looks nervous! We can infer that the mummy is either going to swallow the skeleton or one of his bones! 3. 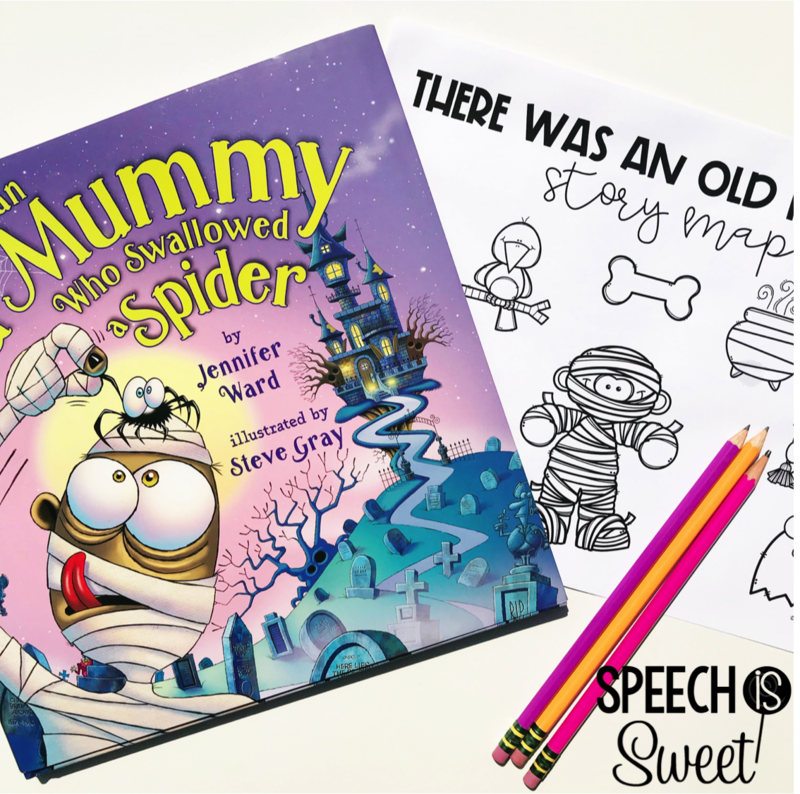 Articulation: This book is jam-packed with /s/ blends (spider, scare, stir, swallowed, splash, spooky, ghost, etc). 4. 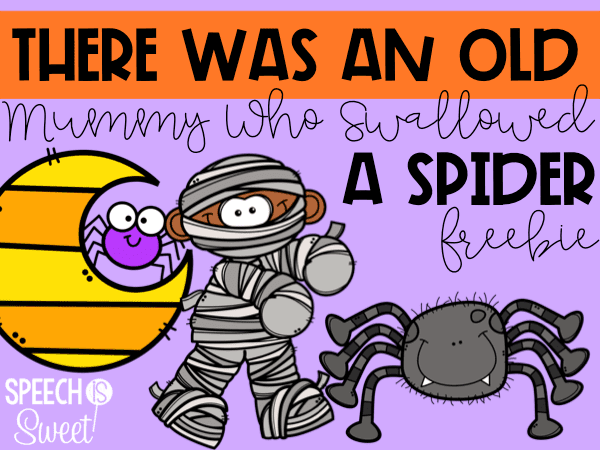 Adjectives: “old mummy,” “spooky ghost,” etc.. Students can even come up with their own adjectives to describe the things that he swallows! 5. Setting: This is a great story to focus on the setting! The mummy travels through a cemetery and makes his way to a haunted house! 6. Semantic Absurdities: The mummy swallows all sorts of absurd items! This books is a great way to introduce students to absurdities! 8. Why Questions – This is a great book for focusing on why questions! Why did he swallow the crow? To poke the rat! 9. Emotions – How did the creatures feel right before they got swallowed? How does the mummy feel? How do the kids feel at the end of the story? 10. Sequencing/Story Retelling – I whipped up a free story map that you can use with your students! I love using these types of books to practice sequencing! This story map provides students with visual cues and can help them retell the story! If you’re interested, you can download this freebie by clicking HERE. I hope you love it! Sign up for my newsletter if you’re interested in more freebies for speech-language therapy and want to receive weekly emails from me! Thank you for stopping by! Have a wonderful day!